Sophie turned one last Friday (and walked for the first time!) — we’ve been busy with our houseguests this week, so this is a little late, but we wanted to share some footage of our little girl in action. She’s a toddler all of a sudden! 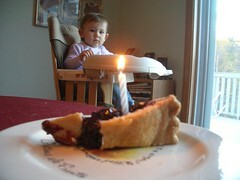 Click on the picture of the birthday pie to see the movie. As always, RealPlayer (or the generic equivalent) required. Next: Sophie, Year Two!